A conviction that native plants are important is what motivated Ruth Douglas to raise her voice. Deciding to become active in their support was not an easy choice for Ruth, who had to overcome an inherently shy personality, but it’s a decision she does not regret. Her journey through deeper levels of commitment has given her valuable insights on what really works when a person wants to be heard in today’s noisy world. 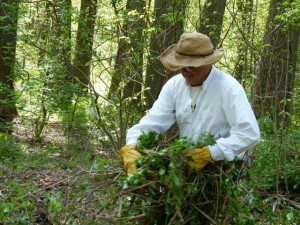 Alan Ford pulling invasive plants on Invasive Plant Removal Day last year. Invasive plants, sometimes defined as “nonnative species that when introduced cause economic or environmental harm or harm to human health,” are one of the biggest threats to healthy, functioning ecosystems today, and that threat was the one Ruth wanted very much to mitigate. She has made significant contributions to the mission of the Virginia Native Plant Society. Her help is sought out by other organizations at the local level as well; and Virginia’s nursery industry leaders, reporters, and state legislators all know they can contact her for information. success builds success, keep trying! Ruth has applied these goals over the years to working with the Virginia Nursery and Landscape Association, (VNLA ), whose goals sometimes conflict with hers. For instance they want to protect their long-term financial investments in selling some plants that escape cultivation in gardens and become destructive to native habitats. There are differing opinions on what is invasive; but Ruth would like to have some of these plants banned from sales. However she has built a good relationship with the people in the industry; not only engaging with them in conversations, but also showing up at their public events to provide visibility. They know she understands their concerns. All those things help smooth the way when it’s time to sit down at the table in Richmond and craft regulations. Ruth has come to value the benefits of teamwork very highly. She notes that working in teams exponentially multiplies the contribution, whatever it may be. The Master Naturalists have been great partners; and though their organization Ruth’s efforts have really expanded into actions. Teamwork has another benefit at the personal level, Ruth admits. It’s easy to get discouraged when the challenges seem so great, but with a team at your side, things look much brighter. The concept of the power is teamwork is definitely embodied in one of Ruth’s most recent commitments, to the Blue Ridge Partnership for Regional Invasive Species Management, or PRISM. This new group is fighting the invasive fight on a model started in the West called Cooperative Weed Management. In Virginia PRISM has grown into a cooperative partnership between dozens of private individuals and organizations, because its founder realized that no matter what he did to control invasives, which had literally taken over large portions of his forest, it would be no avail if he didn’t get his neighbors to do the same. Rod Walker certainly had to raise his voice to put this cooperative together. Now they are looking to be a very successful team. And the Virginia Native Plant Society is now a PRISM member, due in part to the efforts of ~someone~ who was willing to speak out about it. The theme of Blog Action Day this year is RAISE YOUR VOICE. There is a great need for people who are willing to raise their voices in defense of our environment today. Thanks to Ruth for all the times she has spoken out, and for her insights into the right and wrong ways to go about it. Do you have tips of your own you’d like to share? Put them in the Comment box below and we’ll post!